Contact Barbara via email, with your name / address / city / province (state) / postal code (zip code) and phone number. Once Barbara receives your email she will ship the order to you. NOTE: We DO NOT take Pay Pal, credit cards or any other online payment method. CAMBODIA FUNDRAISER - SAVE THE DATES!!! On Friday, May 3rd, we are holding our Annual Cambodia fundraiser. It is at Trinity Presbyterian Church at 2737 Bayview Ave, just south of 401. Events start at 9.30 am. John Rayner will be lecturing. He is fabulous and it is super fun. This will be followed by lunch and a presentation by Patti Lee and then a game in the afternoon. Minimum donation is $40.00 plus $14.00 for lunch and rent (yes, we do pay a substantial rent). There is NO maximum on the donation. 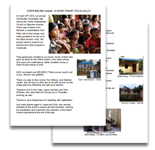 We do need your help so that we can keep sustaining our FIVE schools in remote villages of Cambodia. You will receive a tax receipt for your donation. 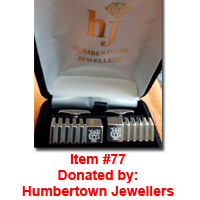 TO BID ON ITEMS: Please email Enid Roitman (enidr18@gmail.com) best way, or phone (416)960-1642. This method of bidding will close at 9 PM on Thursday, May 2nd. The bidding will continue at the fundraiser on Friday May 3rd, until 1:45 pm. On Thursday, May 9, at the Penfield Country club, 1784 Jackson Road, Rochester NY! We will also have a Silent Auction. This year it will be focused on bridge items. Many of our wonderful “A” Players are donating their time to play in a game of bridge with you. This is a priceless opportunity to improve your bridge game, while being gently coached by these experts. As well, Cheryl and Duncan have again volunteered to run a game in your home. What a lovely way to entertain your friends. And much more is being lined up for you to bid on! MINIMUM DONATION of $35.00 (no maximum) (Tax receipts will be issued for your donation) PLUS $20 to cover cost of continental breakfast, lunch, and coffee & tea throughout the day. Please contact Pat Smith at (pannsmit12@gmail.com) or (585) 537-7420 or Sally Hill at (shhill@rochester.rr.com) or (585) 872-1669 with any questions. A HUGE thank you to all of you who generously donated to our Laos project, held on September 21st! Thanks to you, we raised $21,211.00 for Laos. This will buy 170 water filters which will be enough for two remote villages. 170 families will reap the benefit of having clean water for the first time ever. That is over 1000 people. We cannot thank you enough. 80 people attended our fundraiser on 21 September. Congratulations to Elaine Givertz and Catherine Wang who were first overall and won 5.5 master points! Thank you also to all of you who brought toothbrushes and toothpaste over the past few weeks. That was phenomenal. 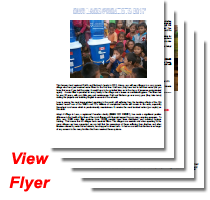 Please view "Our Laos Projects 2017" flyer for pictures of our adventures in Laos and to learn more about the challenges of this wonderful country. To Denise Donovan, Steve Norris (the organizers of the Caledon tournament) and attendees on September 22nd. They raised $653.00 for the children and our schools in Cambodia. The Caledon Sectional Tournament is a great tournament for all levels of players. There too was lots of events for the less experience attendees! Congratulations to the winners of Barbara Segram's & David Bird's Pocket Guide to Defensive Play at Bridge and Barbara's popular cheat sheets! ...who hosted a Cambodia fundraiser at their wonderful bridge club in Oshawa on September 7th, where $2,463.00 was raised. They held a fantastic raffle with amazing prizes. Barbara taught a seminar and 80 attended and stayed to play afterwards. Jerry Howarth (the voice of the Blue Jays) attended also and generously donated two pairs of Blue Jay tickets and stayed to play bridge. ...for giving Patti the space to sell the Cambodia Weaving Centre Scarves at this event - AND to all the players who bought them! All money raised goes to the ladies doing the weaving! One more family will be the happy recipients of their own, private toilet. This is as a result of a wonderful donation in July 2018 by a small group of ladies, who play bridge weekly, from Elmira, Painted Post, & Horseheads, NY. This is such a fantastic gift, both for the privacy and security of the girls and women in the family, but also as a major health and sanitation improvement. So many children become sick or die from illnesses due to sanitary issues. Thank you from both of us and from the children in Cambodia! OVER $12,000 USD RAISED! WOW!!!! 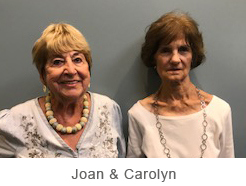 A BIG THANK YOU TO JOAN JOHNSON & CAROLYN HEYN and the Bridge Players from Palos Verdes Peninsula, California! A huge thank you to Joan, Carolyn, and the Bridge Players from Palos Verdes Peninsula for their amazing support of our projects in Cambodia. They raised over $12,000 USD. Absolutely wonderful! Joan & Carolyn and their team (Maria Ashla, Nicole Berte, Robin Hill, and Phyllis Yarnall) organized a bridge bonanza on Thursday, May 17th in Rancho Palos Verdes. They had a bridge lesson in the morning, a delicious lunch, and a duplicate bridge game in the afternoon. 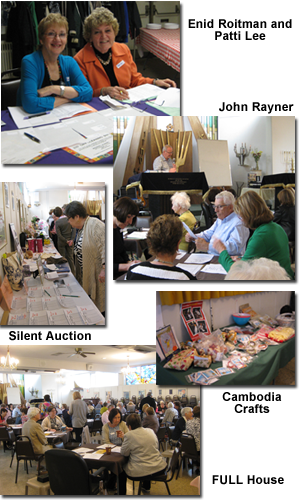 Throughout the day, they held a Silent Auction, with many lovely items, donated by local merchants. Money goes a long way in Cambodia. As an example, the money raised represents enough money to pay all of the salaries, taxes, hydro, supplies, etc for one of our schools for almost two full years, or to supply 20 families with their own private toilet. The whole day was a wonderful success, and the resultant money raised will have a major impact on the lives of the children in Cambodia. Thank You! Thank You! Thank You to Joan, to Carolyn, to the rest of the organizing committee and to the Bridge Players from Palos Verdes Peninsula, who came out and supported this event. We are so appreciative of all that you have done. OVER $7,500 USD raised!!! WHAT A WONDERFUL DAY!!! On May 3rd, the Penfield Country Club near Rochester, NY welcomed 100 attendees to a day of bridge. Barbara taught two bridge lessons; Patti Lee made a presentation about our projects in Cambodia; there were lovely breakfast pastries and a wonderful lunch, a fabulous Silent / Chinese Auction combined, and lots of door prizes. The attendees were generous in their support; and many who could not attend also donated. And, the whole event was run by an amazing committee of 6 women, who worked tirelessly for some months leading up to the big day. As a result, they raised over $7,500 USD!!! Thank you so much to all of the attendees and others for your generous donations. We are very grateful. And a huge thanks to the committee: Pat Smith, Sally Hill, Mary Miller, Susan Rice, Mary Lyke, and Kathy Toole. They handled everything: the promotion of the event, the registrations, the organizing and collecting of the items for the Silent / Chinese Auction, the beautiful presentation of the items, and arranging the site and all of the lovely food. 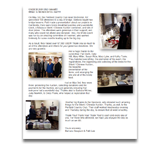 And on May 3rd, they were there: promoting the Auction, collecting donations and the payments for the Auction, and just generally ensuring that everyone had a wonderful day. Thanks also to Barbara McIver, Judy Newkirk, & Cindy Poole, who helped at registration that day. Another big thanks to the Sponsors, who donated such amazing things for the Silent / Chinese Auction. Thanks, as well, to the Penfield Country Club. Their staff worked Wednesday evening and Thursday during the day, to ensure that all went smoothly. Thank You! Thank You! Thank You! to each and every one of you. For those who attended, we hope you enjoyed the day as much as we did. Thank You... OVER $52,000 raised! A HUGE THANK YOU to ALL!!! On April 20th 2018, our annual Cambodian Fundraiser was held at the Trinity Presbyterian Church on Bayview Avenue. There was a lesson from Barbara, a presentation from Patti, lots of door prizes, and many goodies to be bid on in the Silent Auction. And, 160 people came to support our schools and other projects in Cambodia. AND, we raised over $52,000!!!! Thank you so much to all of you. We are very grateful. Thank you also to Alex Kornel, Ron Bishop, and Stephen Laufer, who all gave up their day to be with us and run the bridge game so efficiently and with such aplomb. Thanks to Ann & Ron Katz, Josee Hammill, and Enid Roitman, who were there for the set up on Thursday evening, as well. Thanks to Jane Stephenson for assisting with registration. And many thanks again to Josee and Enid, who worked tirelessly at the event to ensure all went smoothly, working the registration and organizing the collection of the Silent Auction payments at the end of the day. Enid also prepares all of the slips for the Silent Auction and makes it look so inviting. She is amazing! Without all of this help, we really could not run this event. So, many thanks to all of the people, that made it happen. And a huge thank you to all of our Sponsors, who donated such amazing things for our Silent Auction. Please see the list of their names on our websites and please support them. They really deserve all of our support. Thanks, as well, to Trinity Presbyterian Church for allowing us to hold our fundraiser there. The staff worked Thursday evening and Friday during the day, to ensure that all went smoothly. We are so appreciative. January 2018 - FIFTH School Opens! We are very excited to announce the opening of our new, FIFTH school in Taprom Village, Kampot Province. 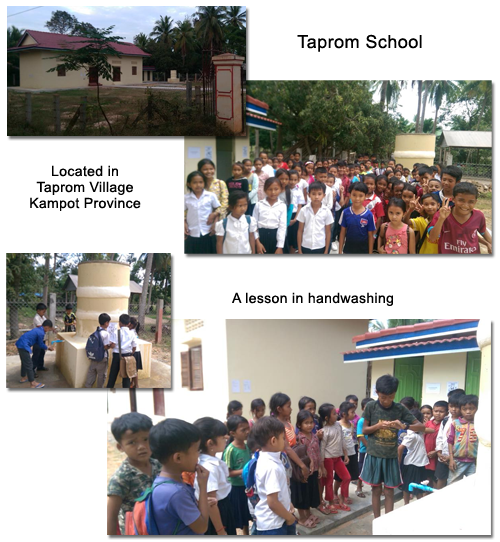 Our new school has a cistern is for water to wash their hands, something all the students are learning about! They do not drink the water from the cistern. Families drink rain water which is “pure”. 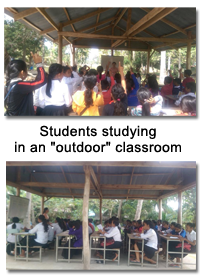 Prior to this school being built, students studied in an "outdoor" classroom, which will still be used to cater for various classes. 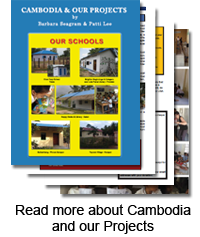 Visit banyantreeorganization.com for more information about ALL of our schools in Cambodia. This limited edition lithoprint has been created for us by Martin Holt, an artist in Israel. It is made possible by Alan Rickhayzen (a British bridge player living in Germany). Buy one lithoprint for $230.00 CAN including shipping and $50.00 Can of this will now go to Barbara and Patti's Cambodia School programme. SIZE: 20" wide by 16" deep. 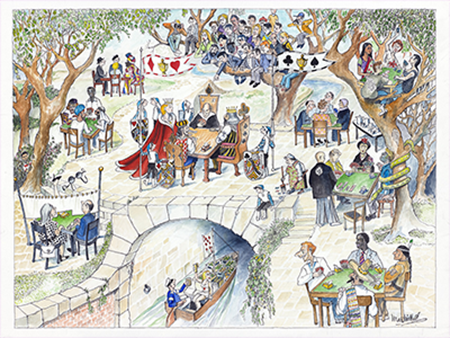 There is tremendous detail in the artwork, all related to the game of bridge, the game we love. Please order. You'll love it! AND you will be supporting Cambodia while you are at it. Go to http://www.seagram.thankupartner.com. You will also receive a few greeting cards with the above print on the front. With thanks from Barbara & Patti. Barbara and Patti now have received a fresh new supply of scarves from Cambodia from our weaving centre there. When you see us, ask us about these as we always have some with us. All money raised from this (every dime) goes to the ladies doing the weaving. Scarves are made from natural fibres. Cotton. 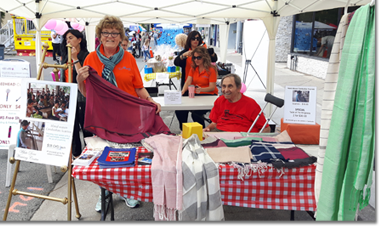 Bloor Street West in Etobicoke, between Prince Edward Drive and Montgomery Road, was the site of the Taste of the Kingsway, Sept. 8-10, 2017. This annual street festival is a renowned culinary and entertainment experience. Over 150 exhibitors participated with demonstrations and interactive exhibits ---- international cuisine, continuous live entertainment, and fresh food. This was a great success as Patti sold 85 scarves!!!! 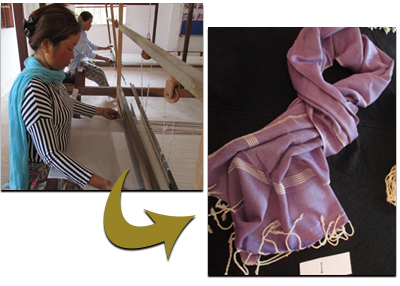 ...with all of the proceeds going back to the women in Cambodia, who made these lovely scarves and who support their families from this work. Our thanks to Mary Matias and Joe Picariello and all of the staff at Salon Allure for their incredible support over the weekend. Allure was one of the exhibitors. Salon Allure is a well-known and beloved hair salon and spa in the Kingsway. Mary Matias, owner, gave Patti Lee space in their booth for Patti to sell the beautiful hand-woven scarves from Cambodia. And thanks to all of the people, who purchased a scarf. What a wonderful event!!! JUNE 2017 - Another Successful Cambodia Fund Raiser! Thank you so much to all of you who supported our fundraiser on Friday June 2nd. There were many who were unable to attend but generously donated to our cause anyway. We are so very grateful to all of you. Thank you also to Enid Roitman, who is always there to help. She makes the Silent Auction table look so fantastic; she greets the people in the morning; and she handles the collection of the Silent Auction payments at the end of the day. We really could not run this function without her. Thank you also to John Rayner, who gave us all a fabulous lesson on our favourite game, bridge. He is outstanding. Thank you to all of our Sponsors, who donated such amazing things for our Silent Auction. Please see the list of their names on our websites and please support them. They really deserve all of our support. One more thank you: A huge thank you to Timothy Eaton Memorial Church for allowing us to hold our fundraiser there. The Timothy Eaton Memorial Church is a wonderful church and we are so grateful to them. We cannot thank you enough, all of you. for those who attended, we hope you enjoyed the events as much as we did. Thank You - Clothing Donated AND Delivered! 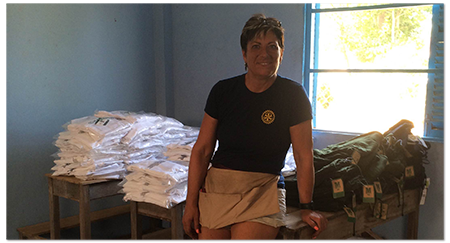 Lynda Miller donated hundreds of brand new white tops and track pants in all sizes; then Leanne took over this huge supply of clothes and books for us for the schools. The golf shirts and sweat pants and books were delivered to the Chan Teap School located in Takeo on Saturday, February 6th when they did the bike distribution. They were most pleased and said to say a big Acun Tran!! (Or however you spell thank you in Khmer). 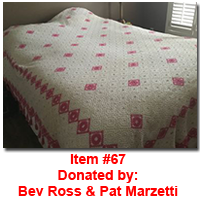 Barbara Seagram and Patti Lee (along with generous donations from their bridge club members, players and friends received from fundraisers) enable many less fortunate to have BETTER lives! Please help us in our mission. Patti and Barbara will take turns going to Laos and Cambodia each year to oversee our projects and to teach while there. See below to learn more about our fundraising efforts. Cambodia: In 2011, Patti Lee, Barbara Seagram and a group of 50, docked in Phnom Penh. We were armed with clothing, pens, notebooks, rulers, sharpeners, toys, pencils, stickers, and other school supplies. We had heard about an Ontario resident, Lisa McCoy, who had dedicated the last few years to working in Cambodia for several months per year. Working alongside Lisa was a fabulous lady, Australian Pauline Johns. Currently, Pauline is living in Cambodia for 6 - 8 months per year and heads up the Cambodian organization ‘Banyan Tree Organization’, which manages all of our projects in Cambodia. Pauline volunteers all of her time and pays for all of her travel and living. In 2011, our group and other friends from the Toronto area donated 40 bicycles to a school outside of Phnom Penh. We went there in a small tuk-tuk along the dusty roads through Phnom Penh and out into the countryside to find that the school was a one-room shack with a cement floor and no desks or chairs. The bikes were given to children, mainly children of landmine victims. It was all very uplifting but Patti and Barbara looked at each other and wondered how long this shack would remain standing. We inquired how much it would cost to build a permanent school and found that it would cost $24,000.00 We returned to Toronto determined to build a school. We raised $40,000.00 that year, so we also furnished two other schools and built a library at one of the schools. Since then, a fifth school has been added; we now have over 600 students in our schools—and we remain committed to sustaining all FIVE schools at a cost of $40,000 CDN per year. This pays for the salaries of the teachers and librarians, all of the supplies for the teachers and students, lease payments, electricity, maintenance etc. You can see that money goes a long way in this country. She visited all the schools and taught English while there! All the school children are looking forward to her return. Over the years, many outreach programs have been undertaken to help these landmine affected families to become self-sufficient: a bike repair business, chicken farmer training, sewing lessons with a sewing machine, crafts, a technology centre, and a weaving centre. There is also a huge need in the remote villages for medical help. Many never see a doctor: they do not have a doctor and cannot afford to travel to one. Malaria and tuberculosis continue to plague the remote villages. We need to educate throughout rural areas regarding the need for sanitation, aiding in the prevention and transmission of diseases. We need to work to ensure the health of mothers during pregnancy and childbirth. Safe Water. Access to safe water, a fundamental human need and a basic human right. In some cases, this may be as simple as teaching them the necessity of boiling water. Hygiene & Sanitation. Access to health care and education aiding in the prevention and transmission of diseases, including: Handwashing Stations / Toilets / Days for Girls Kits. There are many that do not have a safe, private toilet. The absence of a safe, private toilet leads to serious health issues, as well as sexual abuse of women and girls. Our schools all have toilets, thus ensuring that the girls can attend school even during their menstrual period. Without toilets at the schools, the girls would miss many days a month of school and often do not return once this has happened a few times. We will be sponsoring a second student to start university in August, 2019. Both our first year and upcoming second year students are 3-year commitments, which include tuition, books, and living expenses. We have installed 10 toilets over the past year for 10 families in the villages near our schools. TEN more toilets will be installed over the next year for ten other families. We have installed handwashing stations at one school, and will be installing them in two more schools over the next year. We are looking at projects to capture rain water to be used as safe drinking water for the children while at school. 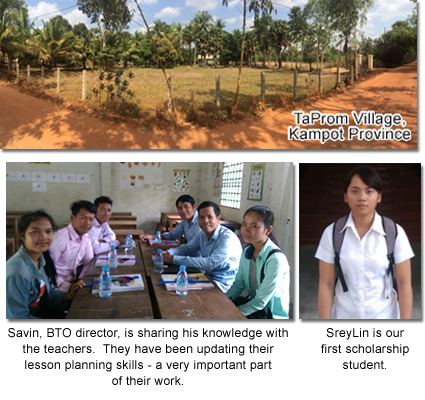 Construction for the new fifth school commenced this week in TaProm Village, Kampot Province. Savin has been teaching some students in his spare time. They’re very excited to soon have a new classroom and library for their studies. Patti and Barbara are excited and optimistic about all of these projects and the fundraisers that we do every year. If you are unable to attend one of our fundraisers, but still wish to make a donation, we would be so grateful. Barbara and Patti are an Agency of a charity in Canada; as well, they have formed an alliance with a charity in the USA. As a result, all Canadian and USA donors can receive tax receipts, valid for their own country. THANK YOU to Jan and Phil and to all those who attended Barbara's bridge class held in Cabo San Lucas, Mexico (February 2017). We raised $9,500.00 USD for Cambodia!!!. VERY exciting and the $$ will go a long way to help so many people. THANK YOU... To all our Cambodia supporters! Our annual Cambodia fundraiser took place on Fri 29 April 2016 and to date we have raised $33,556.00!! A big thank you from Patti and I for your incredible generosity! It costs us $20,000.00 per year to sustain our four schools. In addition, we also have outreach programs for landmine survivors and their families. It is also important that we build a "war chest" so that our schools can be sustained for some years after we are no longer able to do fundraising. Our thanks to John Rayner for entertaining us and teaching us so that by this time next year, we will all be ready to represent our country! Our thanks also to Enid Roitman who is our right arm at all times. She is so organized and her attention to detail is legendary. So many of you helped but special thanks also to Ann Katz who came at the crack of dawn and helped us so much with set-up and put away. A huge thank you to the merchants and to so many of you who donated items for the silent auction. Our premier item was the Farmhouse in France owned by Sally Moore. Sally has generously donated a week at this wonderful farmhouse year after year for our auction. It was purchased for $2,500.00 so you can imagine that we are delighted! Congratulations to the winners of the game that afternoon. This was a sectionally rated championship event (as are all our fundraisers). Helen Wiber and Magdi Barsoum came first overall and won 7.31 master points!! WOW!! Peggy Sinclair and Janet Dunfield came second overall and won 5.48 master points! Shirley Towers and Barry Spinner were third overall winning 4.11 points and Holly Kee and Marg Roberts were fourth overall and won 3.48 points. Our 4th Annual Cambodia Fundraiser raised $5,233.00. We are really pleased. Thanks to Linda Harrison, who never stopped for a moment and was unflappable as always. She is amazing and is such an excellent volunteer. Our thanks as well to Carolyn and Karen, who were also wonderful. Thank you too to all those who donated to our Silent Auction and those that made the bids! Approximately 100 people attended which was an excellent turnout. All proceeds go to our four schools in Cambodia. Thank you so much to all of you who supported our fundraiser on Friday May 1st, 2015. There were many who were unable to attend but generously donated to our cause anyway. We are so very grateful to all of you. Thank you also to Enid Roitman who is always there to help. Her organizational skills are legendary and there is no project too daunting for her. Thank you also to John Rayner who gave us all a fabulous presentation on hand evaluation, bidding and defence. He is outstanding. One more thank you: A huge thank you to Habonim Synagogue for donating the space for our fundraiser. Habonim does such good work in the community and we are so grateful to them. We raised over $31,000.00! That is an amazing number and we are over the moon about it! In our very first year, we raised $8,800.00. Last year: $22,000.00 and the figure this year is staggering! We do need it as we have many projects ahead of us in Cambodia; these funds will be put to very good use helping us to ensure that the mothers, infants, and children receive the health care that they need and the education we would all wish for! We cannot thank you enough, all of you. Those who attended, we hope you enjoyed the event as much as we did. Please visit the Banyan Tree Organization website (www.banyantreeorganization.com). Close scores! Remember, just an overtrick can make the difference! Toronto, Gravenhurst and other communities in Canada have been incredibly generous in supporting our projects in Cambodia. These include supplies, overhead costs and staffing of four schools and two libraries. We now have 580 students in these 4 schools. The libraries are the only source of books in these remote villages. 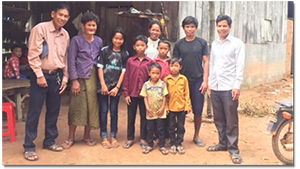 We have now recognized that there is an enormous need for a Family Health Clinic in Takeo province, where some of our schools are located. Most of these families never see a doctor and some things that could be rectified go undetected until it is too late. Barbara Seagram & Patti Lee, along with players from all over Ontario, raised money in 2012 to build a school in Cambodia, ½ hr out of Phnom Penh. With extra funds raised, they also built a library at another school. They also furnished three schools, supplied electricity to another and provided books and computers to a current total of four schools. Two of the schools are in very remote villages. They are committed to sustaining four schools in Cambodia over the next many years. Lisa and Pauline, who are Board Members of AMFW and Founders & Operators of BLT, conduct the work of these organizations. It costs approximately $17,000.00 a year to sustain these schools and libraries. Thanks to all who supported our recent Cambodian fundraisers held at our Out of Town Seminars! 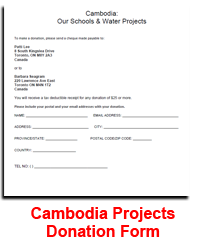 Our 3rd Annual Cambodia Fundraiser in Gravenhurst on October 2, 2014 raised $7,200.00. GREAT work by Linda Harrison and her team, Carolyne and Kelly. On August 15, 2014 Barbara taught a class to the Haliburton Bridge Community, after which they all played bridge. They raised $1,500 for our Cambodian Schools! 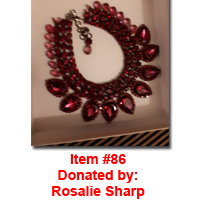 Barbara Seagram & Patti Lee wish to thank all of the attendees, donors, sponsors, and all of those, who bid on the Silent Auction at our Cambodian fundrasier held on June 19, 2014. The Silent Auction bidding began almost a week before the event, with Patti taking bids by phone and email. The excitement rose as we got closer to the event. The attendees seemed to love the day itself. Barbara taught a lesson on "doubles" and Patti made a presentation on Cambodia and where the money is being spent. A bridge game in the afternoon with prizes and of course, lots of coffee, a nice lunch, sweets and fruit, and door prizes for at least half of the attendees rounded out the day. Our special thanks to Enid Roitman for all of her help before the event and all day on June 19th. She makes it all look so easy. As well thanks to Cathy Hogg, who helped us that day, and to Mirko and his staff for the wonderful food. And most of all, thanks to you for your wonderful support. It all happens because of you! Barbara, Patti, and the children of Cambodia are so appreciative. 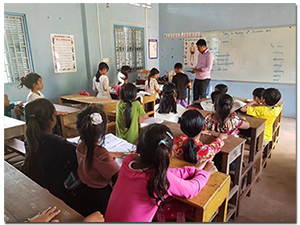 Every dime raised on June 19th will go to our 4 schools that we sustain in Cambodia AND towards the building of the FAMILY HEALTH CLINIC, a first line of medical support for local families that dont have a doctor nor can they travel to one. Thank you everyone for your generous support. We raised $2,440 with this draw which was held Jan. 13th. The money (every dime) goes to our Cambodia schools. Patti and Barbara hoped to raise $1,500.00. 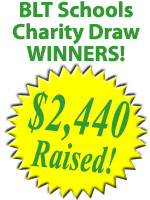 We only dreamed about making $2,000.00... and we have EXCEEDED our wildest expectations with this total of $2,440.00. We are thrilled! Thanks to all who participated in the "Take More Tricks... Improve Your Delcarer Play" fundraising seminar for Cambodia by Barbara Seagram. All money raised (every dime) goes directly to Banyan Tree Organization schools in Cambodia. These schools are built and sustained by Barbara Seagram, Patti Lee and the bridge community of Toronto and beyond! A fun day of bridge with Bridge Masters Barbara Seagram & Patti Lee was held on September 26, 2013 in Gravenhurst, which included door prizes and silent auction! Thanks to the participants, $4,257.00 was raised at this event! In the first of its kind for Granvenhurst, a Seminar and Bridge Game fundraiser held in September 2012, raised a GRAND total of $4,369! Laos is one of the poorest countries in Southeast Asia. It is at least 20 years behind all the other countries of that region. From 1964 to 1973, the U.S. dropped more than two million tons of ordnance on Laos during 580,000 bombing missions - equal to a planeload of bombs every 8 minutes, 24-hours a day, for 9 years - making Laos the most heavily bombed country per capita in history. The bombings were part of the U.S. Secret War in Laos to support the Royal Lao Government against the Pathet Lao (Communist) and to interfere with traffic along the Ho Chi Minh Trail. The bombings destroyed many villages and displaced hundreds of thousands of Lao civilians during the nine-year period. Barbara Seagram & Patti Lee visited Laos for the first time in 2012. The remote villages of Laos have never recovered from the 'Secret' war of the 1960s. Laos has the dubious distinction of being the most bombed country, per capita, in history. While rich in culture and tradition, their education, healthcare and hygiene conditions are severely lacking. The average lifespan is only 56 years and average age is only 20.8, caused by poor quality water, poor hygiene and general poverty. 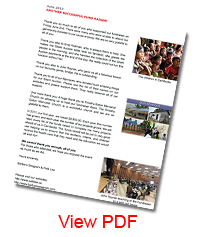 BUT with your help we have already made a difference in the lives of thousands of villagers. Made huge improvements to a hospital (which services many surrounding villages) including putting water into the hospital. Imagine a hospital with no water! He has installed over 1175 water filter systems, each one serving an average family of 5-8. He has sponsored 19 primary school kids for school who could not otherwise have attended. He has sponsored four University students and continues to do so. There are many other projects that he is involved in: i.e. building fences around compounds to keep the oxen out, furnishing a huge education centre (where they train teachers), bought 52 bicycles for school kids, installed solar lighting in several villages etc. Over this upcoming year, he will be building a three room school and putting on two school additions. He will install another 800 water filters at least. To receive a filter, they must take a basic hygiene & sanitation course from Steve. When one village was asked how many people had dysentery (diarrhea) in the past year, 300 hands (all) went up. Six months later, after the water filters were installed, 2 hands went up. That is 143 water filters, providing more than one village and approximately 860 people with clean water for the first time in their lives. We are very excited about this and are so grateful to all our generous donors, some of whom attended our fundraiser on Sept 12th. Thank you one and all for your support of our Laos project. 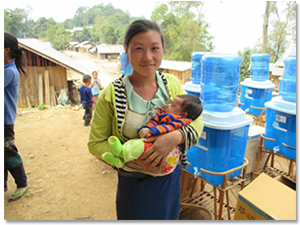 Thanks to the support of so many of you in Toronto, Collingwood and beyond, we have raised $12,093.00 to date for our water filter project in Laos at our fundraiser, June 7, 2016. Some of the cost included in the price of a water filter is the need to transport these water filters by trucks over mountainous terrain into the remote villages in Laos. This means that we have purchased just over 94 water filters. 94 families (approximately 650 people) will now have clean water for the first time in their lives, thanks to all of you. Each family typically consists of 6-8 people, often three generations living in one small home. Our thanks to Steve Rutledge, our guest speaker and is our amazing volunteer on the ground in Laos and Lee Daugharty for his support of this event! The bridge community of Toronto (That's YOU!!!) 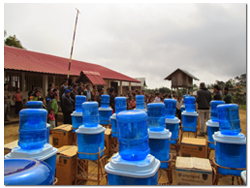 has helped to raise funds over the past few years for HUNDREDS of water filters for remote villages in Laos. To get a real sense of what goes on in a village on a daily basis, one of our volunteers, Massimo, who comes each year from Italy to help on the ground, produced this video: https://www.youtube.com/watch?v=F1GQ4r19j_4 Do hope you can take the time to watch this. Here is our volunteer on the ground, Steve Rutledge, who created Adopt A Village in Laos. 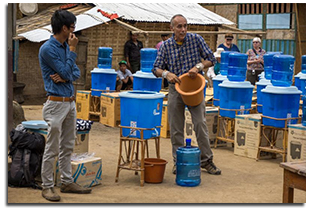 This is a shot of a typical water filter distribution day where Steve is showing the villagers how the water filter works. These water filters will last at least 25 years and only need to be cleaned once a month or so by using a soft brush or cloth to clean the inside of the filter. Also in the picture is his wonderful assistant, Siphan, who is from Laos and carries on the work for Steve when he is not there. Thank you to all our supporters who on June 9, 2015, attended the Laos Water Filter Seminar! Together We Are Making a Difference!! We are VERY pleased! The fundraiser for Laos this year raised $9,564.00 for water filters. That is the equivalent of clean water for 20 years for 100 families. Since 2012, this fundraiser has provided 500 water filters for 500 families. While most of us have never been without clean water, the impact of this contribution to these families is life changing. Thank you for your generosity. So little from us means so much to them", says Lee Daugharty. All monies raised (every dime) goes to the cause. There are no administration fees. All volunteers pay their own airfare, accommodation and meals. If you would like to help, send your donation (made out to Adopt a Village in Laos) to Barbara Seagram, 220 Lawrence Ave East, Toronto ON M4N 1T2, Canada. $125.00 Can or $100.00 USD buys a water filter for a family. Thank you one and all for your support. A very special thank you to Lee Daugharty who is not only ran the game, but also donated $3.00pp of his own towards the cause! Barbara brought in a young man from a village 10 hours away (he came by motorcycle all that way!) to be our guide for 8 days. Patti and I had met him 3 years ago. Khamkeo was a student at University then and now teaches in his very remote village. He is teaching us Lao and we are teaching him English and other skills. on April 23, 2014. We raised $6,007 for 80 new water filters! Also a BIG thank you to Lee Daugharty who donated $2/person!